If you have a disability or use a power wheelchair, there are things you can do to make your life easier at home that don’t require major renovations. These ideas are mostly low-cost and make difficult tasks easier to manage, especially if you live alone. If you use a manual or power wheelchair in your daily life, these accessibility hacks can truly benefit you. Sometimes, the most basic changes can go a long way in conserving energy and enhancing your mobility. Here is what you can do to make your home more accessible and increase your mobility and independence. To reduce the height of stairs, you can build rectangular, boxed platforms of varying heights. Place non-skid strips on them for better traction. By reducing the height, you shorten the repetitive movements of climbing stairs. Rubber threshold ramps are extremely durable and provide a safe way to cross thresholds and small steps with a manual or electric wheelchair. Practical and affordable, rubber ramps are easy to install and slip resistant. Grab-and-pull bars greatly improve accessibility in places like kitchens, bathtubs and showers. You can find them at your local hardware store. Wrought-iron drawer pulls are great for cabinets. Twelve-inch suction cup grab bars are ideal for the bathroom. It’s important to understand, however, that grab-and-pulls are designed to maintain balance and stability and are not weight-bearing. Stairlifts can be expensive, but they are a safe alternative to climbing stairs of a multi-level home, especially for power wheelchair users. Stairlifts can carry people or objects. Search for a used stairlift that still offers a warranty. It’s a good idea to research stairlift reviews before buying. There are basic items that can help with everyday activities that many be difficult for people with disabilities who struggle with fine motor skills. Clothing loops and hook-and-loop clothing fasteners can assist with getting dressed. Also, consider purchasing clothing from an adaptive clothing company. Accessible living solutions include cooking your meals in bulk or using a slow cooker. Use paper plates to reduce cleanup. Most importantly, do more strenuous tasks at the time of day when you have the most energy. Purchase ADA-compliant faucets, door handles and light pulls. These fixtures are adapted for a variety of special needs and disabilities. Go electric and ditch the handheld can opener. Purchase electric-operated appliances such as can openers, food processors and jar openers. When purchasing an accessible van, consider whether you plan to drive the vehicle, or you will have a caretaker drive you. Also consider the dimensions of your electric wheelchair. Research wheelchair accessible van reviews and consider purchasing a used wheelchair van. 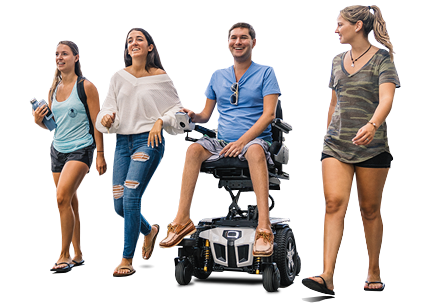 To find out how iLevel Power Wheelchairs can benefit you, click here.